D'Blog of 'Israeli: Whatever Happened To Mike Dringenberg? Whatever Happened To Mike Dringenberg? In the Great Game-Stickleback interregnum, I'm catching up with sorting my photos - there are a load from the wedding-rich month of August; aside from Dave Moyes' do in Scotland, we also went to Spain for Mark Buckingham’s wedding. 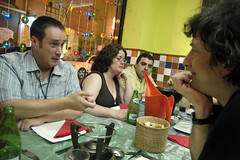 These are from a night out with Mark, his fiancee Irma, Duncan & Diana Fegredo, and Neil Gaiman. 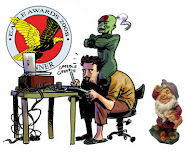 Duncan Fegredo tells it how it is to Neil Gaiman. It was a bit of a reunion, as Mark, Neil and I all used to be on the committee of the Society for Strip Illustration (the SSI, now called the CCG) back in the late 80's and early 90's*. I'd not seen Neil for about 15 years, but he was still the same as ever, affable, good-hearted and a fund of amusing anecdotes. I'd wondered if I’d find him intimidating, given his string of best-selling novels and movie deals, but on reflection, Neil always did seem like the sort of bloke who should have a string of of best-selling novels and movie deals; the world finally caught up with him, that's all. I thanked him for the ongoing blessing of my Sandman royalties; even today, I still make a couple of hundred dollars a quarter. He smiled and then looked serious. "I sorta feel bad," he said, "for not getting you on a better book." Well..." he replied, "Mike Dringenberg, he pretty much retired on his royalties from Preludes and Nocturnes. Even today, he must make at least $8000 a quarter." Ah, well. Owt's better than nowt, as we say in Sheffield. 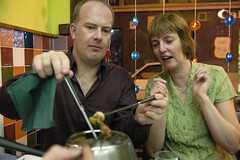 from a scalding meat fondue. 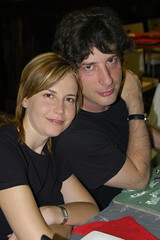 Irma Page (now Irma, Lady Buckingham) with Neil Gaiman. Now, you may well be wondering how it is, given all my bitching about tight deadlines last month, that I found a week to go to Spain. Well, last Autumn, Mark and Irma had invited me to be a witness at their wedding, and at the time, The Great Game was due for completion at the end of July 2006. By the time we actually got to August 2006, I was running a month late, but I didn't want to miss my old mate's wedding, it would have made life difficult for them having to change witnesses, and we had flights and a hotel room booked. I decided to go and try and work while I was in Spain, which worked out okay in the end. 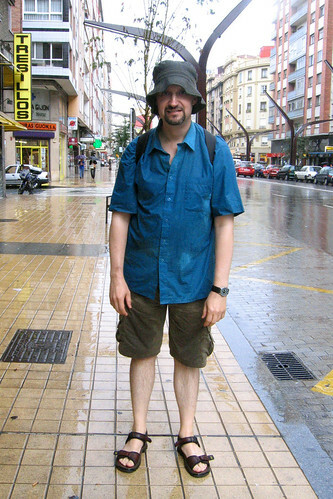 Rex Harrison lied to us; the rain in Spain doesn't stay mainly in the plain. he;ll be staying at our house for a week and i will force him to do mucho art ! So... Mike Dringenberg is doing... nothing?!?!? Come on!! Did he get so much money with Sandman and Magic to spend the life doing what most of people would love to do: only have fun? Now, serious: Isn't he doing any work of art nowadays? I really like his art and I really would love to have some of original of it one day. What would he be doing at this moment while I work?